"Alex Spain: The Sporting Master" by John M. Stronge. poss. descendant of Edward III and Aoife Mac Murrough and Brian Boru. He was educ Christian Brothers, Cashel, Co.Tipperary. Family moved back to Dublin. He was educ Blackrock College 1908-15. Played rugby for Blackrock. Won JCT 1911 and 1912. He was educ UCD. BA 1918. Studied for priesthood, but left. Started studying medicine in UCD 1919. Played rugby for UCD. Captain of UCD rugby club. Captain in 1924 when they won Leinster Club Senior Cup (see photo in Belfield House, UCD). Later he was President of the club. Gynaecologist. MB, B.Ch., B.A.O., UCD 1924 [NUI, 1964]. Played rugby for Ireland against New Zealand, in Dublin, 1 Nov 1924, during the famous New Zealand tour of 1924-25, when New Zealand won everything. Worked Mater Hospital, Dublin, as at 1925. Assistant Master of Holles St Hospital (National Maternity Hospital), Dublin, 1926-27 [plaque in hall]. M.A.O. NUI 1929, MRCOG 1929. (todo) see mar of Alexander W Spain, Rathdown, 3rd qr 1929, [GROI], vol 2 p 672. Lived 31 Lower Baggot St, Dublin, where he started a private practice. Working Mater Hospital again as at 1938. 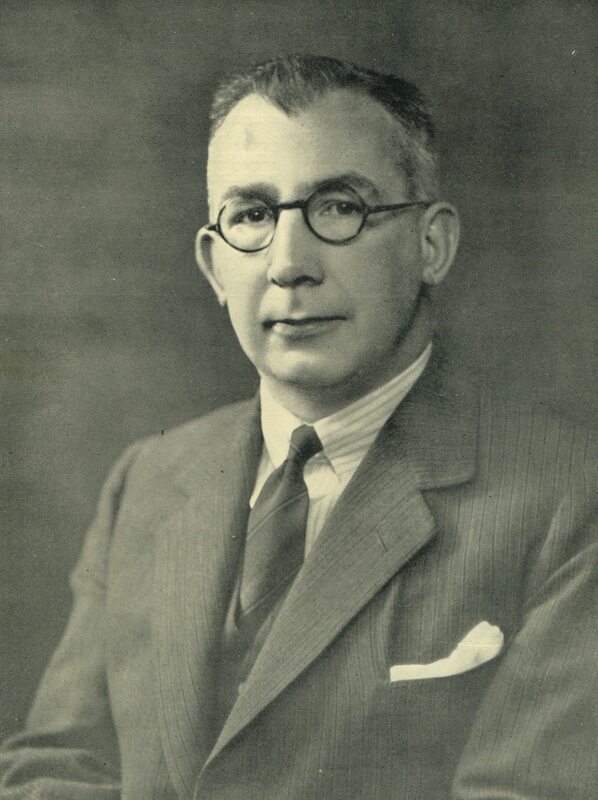 President of Blackrock College Union 1938. Master of Holles St Hospital 1942-48 [plaque inside door]. Lived and had practice in 20 Fitzwilliam Square South, Dublin [NOT 18]. Retired. Went back to live in Cashel, Co.Tipperary, for some years, having bought the Mullins shop. Eileen opened an antiques shop next to Mullins' in Cashel. Moved back to Dublin, lived Dundrum. Eileen ran an antiques shop in Ranelagh. Lived at some point at Faitealan, Carrick Hill, Malahide, N Co.Dublin. In later years the two of them were in a nursing home, Our Lady's Manor, Bullock Harbour, Dalkey, Co.Dublin. He died 24 Feb 1982, age 84 yrs. His portrait hangs in Holles St Hospital. Eileen died 20 Mar 1988, age 84 yrs. 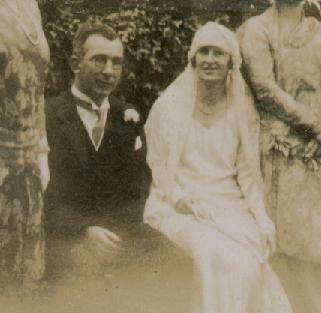 Justin Spain, wrote family history, mar Sarah O'Riain and had issue. Alex Davern, mar Eileen Henry. 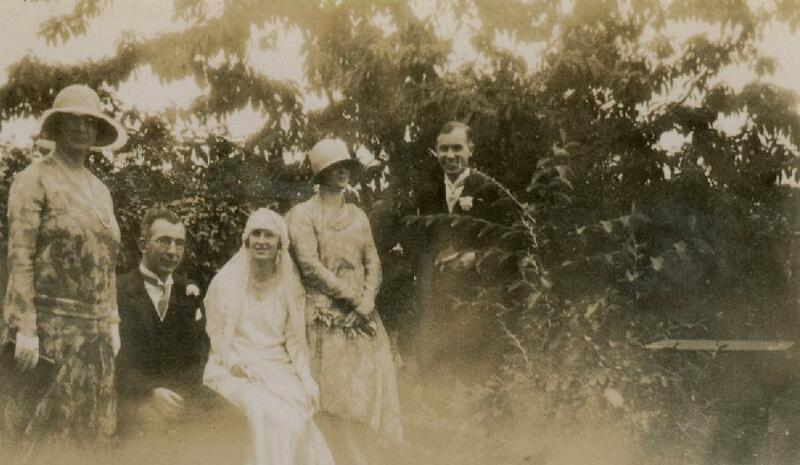 Alec and Eileen's wedding, 1929. See full size. And so was wed with an O'Mara daughter." - From a poem written by Alec to Eileen on their 40th anniversary, 1969.